Home \ CFBMC Members \ News \ Community Foundation receives $1 million matching fund grant from Lilly Endowment Inc. Marching grant funds to support unrestricted, Thrive by Five, agency, field of interest, and donor advised endowment funds. The Community Foundation of Bloomington and Monroe County (CFBMC) has received a grant of $1 million as part of Lilly Endowment Inc.’s seventh phase of its Giving Indiana Funds for Tomorrow (GIFT) initiative. 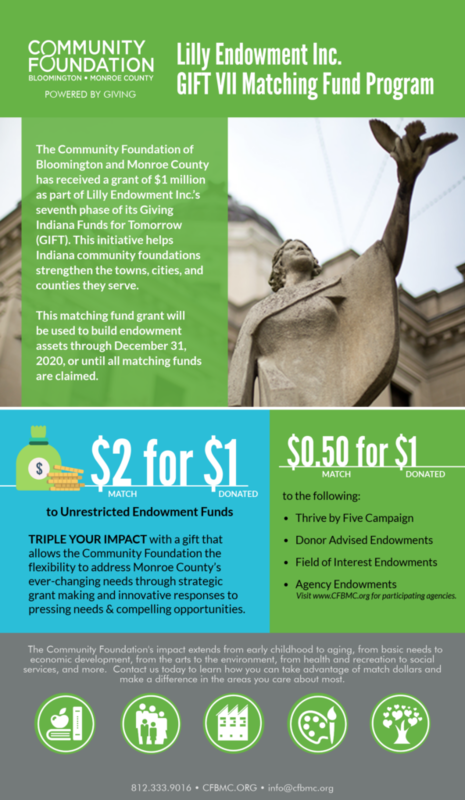 With GIFT VII, the Endowment is making up to $125 million available to help Indiana community foundations strengthen the towns, cities, and counties they serve. CFBMC will use this matching fund grant to build endowment assets to support our charitable activities. At least two-thirds ($667,000) of the matching fund grant must be designated to support the growth of CFBMC’s unrestricted endowments, which over time will provide flexibility to help the Foundation to meet the community’s most pressing needs or compelling opportunities. The Endowment will provide $2 for every $1 contributed to CFBMC’s unrestricted funds during the matching period, October 1, 2018, through December 31, 2020. The Thrive by Five Campaign & early learning endowment gifts: Launched in 2017, Thrive by Five is an endowment campaign with a goal to raise $1 million to sustain early learning initiatives in Monroe County through the Community Foundation’s Monroe Smart Start program. Thrive by Five endowment funds will be used for increasing access to high-quality education, improving quality of programs, cultivating family engagement and community partnerships, developing training opportunities for educators, and providing required community matching funds for On My Way Pre-K students. Field of interest and donor advised fund gifts: Support for field of interest or donor-advised endowments at the Community Foundation. Contributions to these types of funds give donors opportunities to target areas from basic needs to economic development, arts to the environment, health and recreation to social services for local families and more. To encourage the engagement of CFMBC’s board of directors, the Endowment also will award an additional $100,000 unrestricted grant if the foundation achieves 100 percent financial support from each of our board members during the period January 1, 2019, through June 30, 2020. This year, CFBMC will also have the opportunity to apply for more funds through GIFT VII’s community leadership grants. This component includes both planning and implementation grants, which are available to help the Foundation deepen its understanding of the challenges and opportunities facing our community; convene key local stakeholders and explore how it can effectively play a leadership role in implementing initiatives and strategies that enhance the quality of life in Monroe County. Lilly Endowment Inc. is an Indianapolis-based private philanthropic foundation created in 1937 by three members of the Lilly family – J.K. Lilly Sr. and sons J.K. Jr. and Eli – through gifts of stock in their pharmaceutical business, Eli Lilly & Company. The Endowment exists to support causes of community development, education, and religion. Lilly Endowment’s community development grantmaking is designed to support efforts that enhance the quality of life in Indianapolis and Indiana. One Response to Community Foundation receives $1 million matching fund grant from Lilly Endowment Inc.